Data analysis consists not only of selecting records but also of setting some conditions by which the records should be presented. A condition is set as if using a funnel that decides what to let through and what to exclude. The condition or rule is also called a criterion. A filter is a criterion or a set of criteria that must be applied to a set to create a list of records that abide by a common rule. 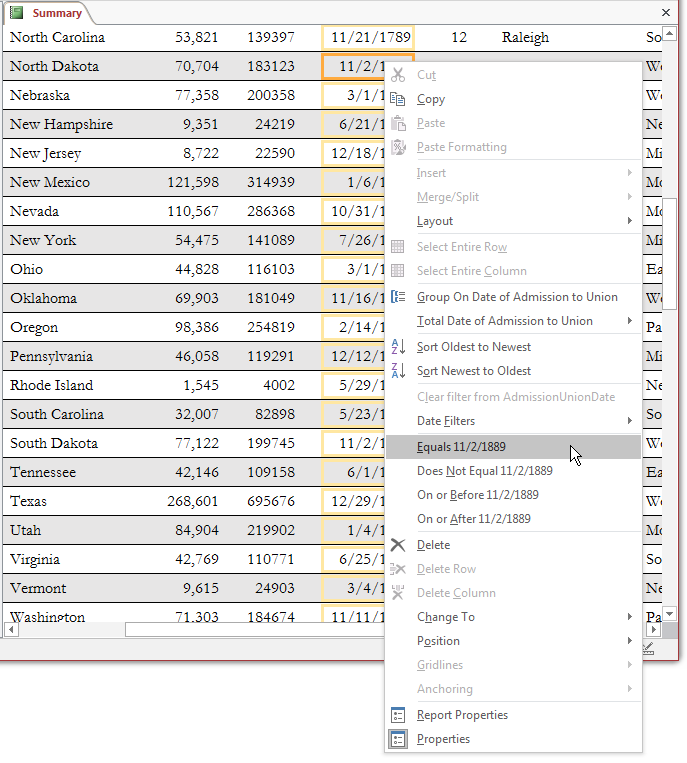 Filters can be used to isolate records on a table, a query, a form, or a report. There are differences on the way each type of value handles a filter. If necessary, on the Ribbon, click Home. 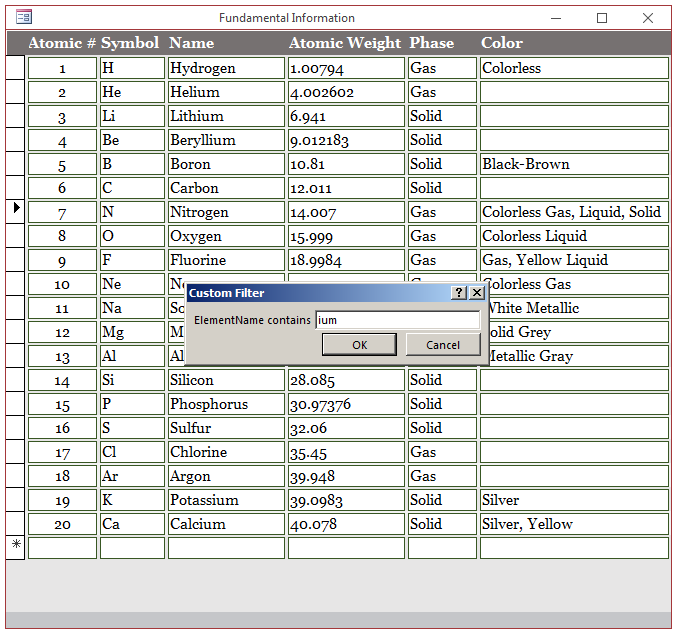 Microsoft Access provides various techniques to visually filter records. 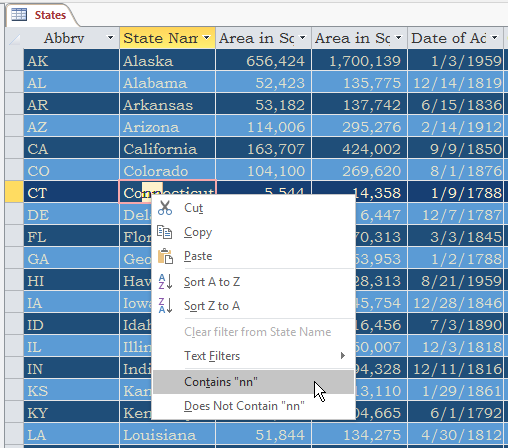 As we will see in future sections and lessons, to filter records, you will right-click the list or use buttons in the Sort & Filter section in the Home tab of the Ribbon. 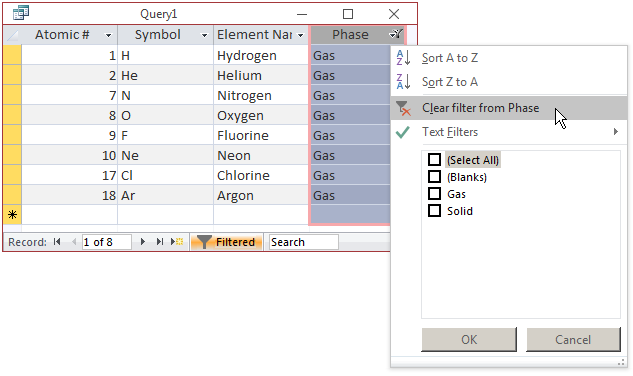 When a table, a query, a form, or a report is filtered, in the Sort & Filter section of the Ribbon, the Toggle Filter button is highlighted . 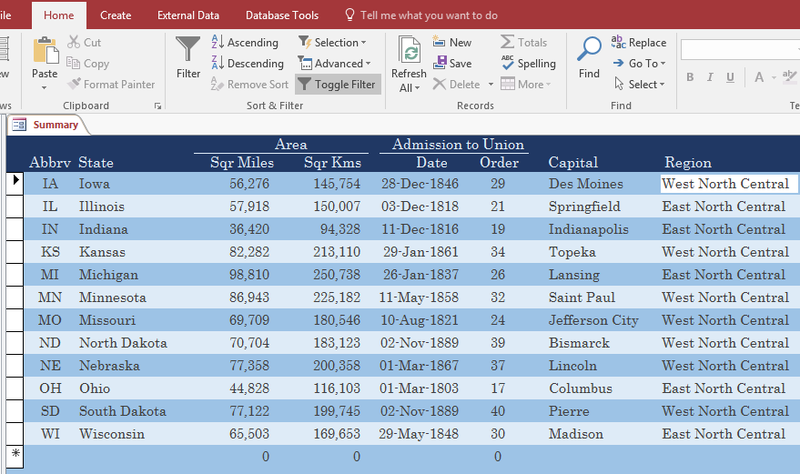 Also, the bottom section of the table, query, or form displays a Filtered button . 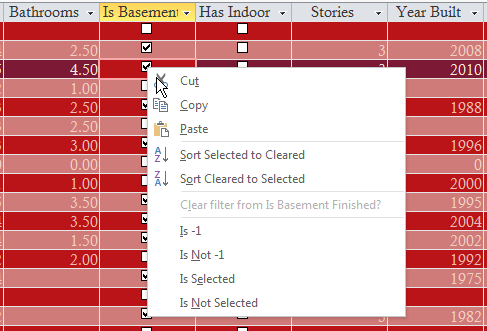 If you perform another filter on the list, only the selected records would be considered. This means that you must decide whether you want the new filtering to apply to all records or only to the new ones. 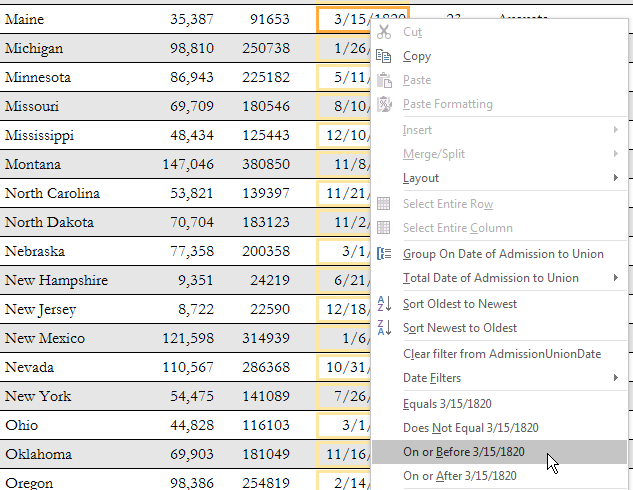 If you want to use all records of the list, you must first remove the previous filter. 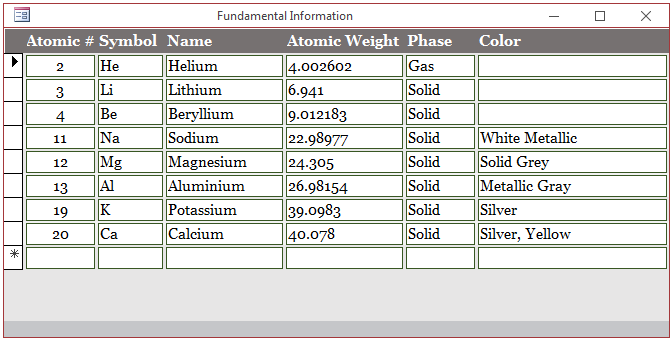 In this and the next lessons, we will see different ways to examine the values stored in a database. Every time you finish analyzing data, you can dismiss the result or save it. If you don't save the result, all the analysis will be lost. 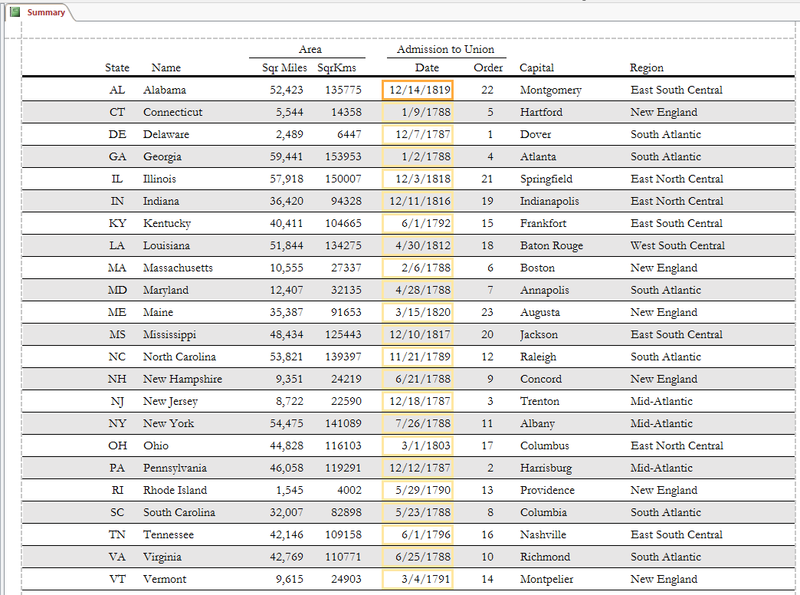 The best way to save the results of data analysis is by saving them in a query. 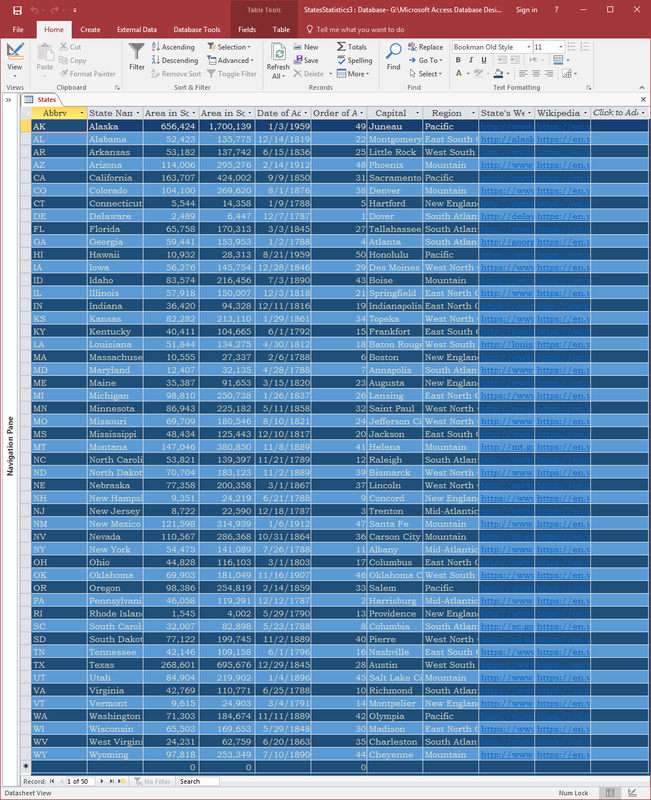 Besides the ability to save sorted and/or filtered lists, queries provide advanced techniques of performing data analysis. Because they use the SQL, they use a syntax that is not directly available to tables, forms, and reports. In fact, queries provide a good alternative to creating the record source that can be used to populate forms and reports. Imagine you have a list where some records share a certain value. Based on such a field, you can retrieve a list that includes only the particular string, that is, records that share that value. This is referred to as as filtering by selection. 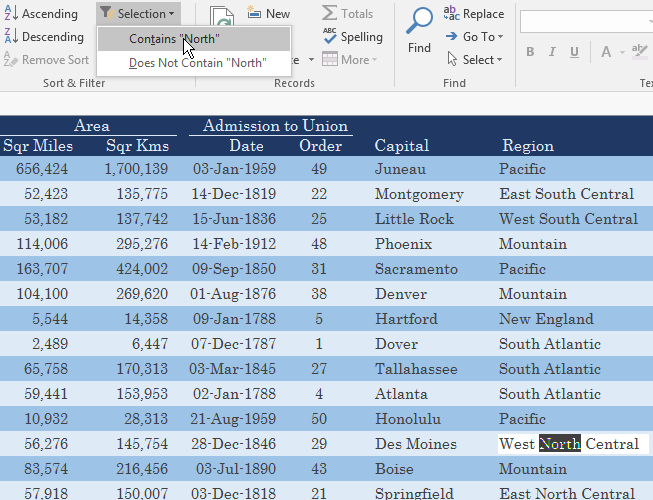 After clicking, the object will display only the records that share the specified in the field. 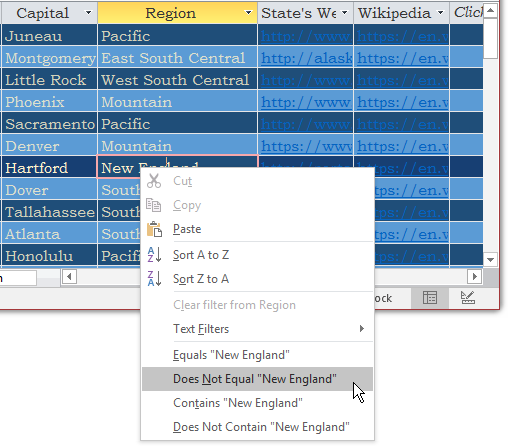 To see only the states in New England, in the Region column, right-click New England and click Equals "New England"
Another way to filter records is while you are designing a table, a query, a form or a report. 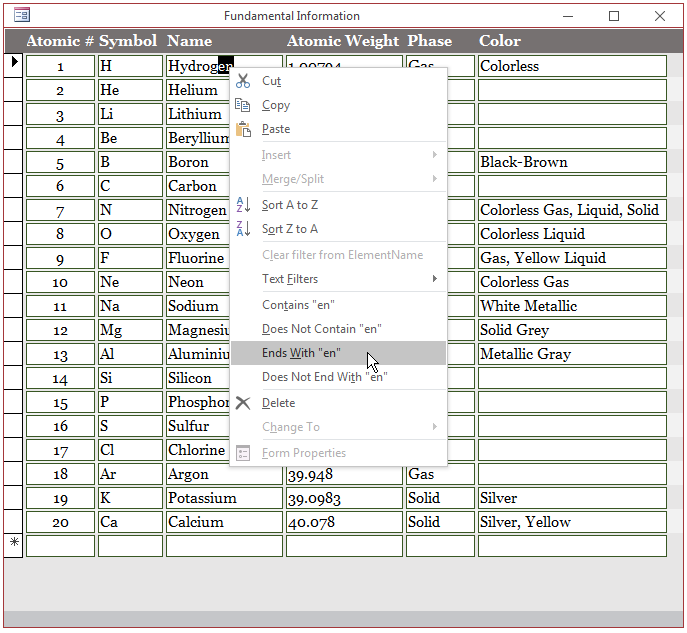 In order to see the results for a table, you must first save it. 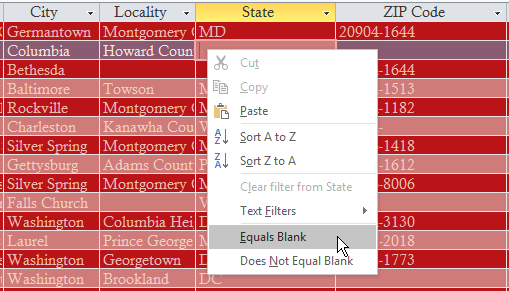 If you save the table like that, the filtering feature would be included in the table. To filter records in design, display the object in Design View. Use the Property Sheet of the table, use the bottom part of the field that will use the filter for a query, user the Record Source for the form or report. 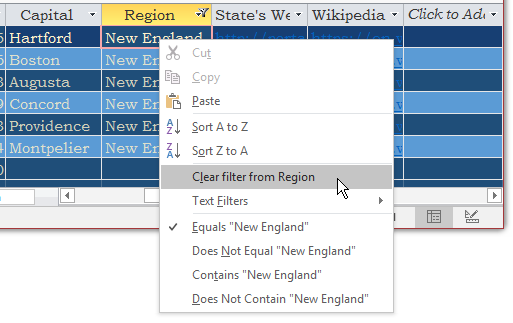 To see the states outside of New England, in the Region column, right-click New England and click Does Not Equals "New England"
If the data type of the field by which you want to filter records is number-based, you can find records that use the same value or those that use different values. You can also find records that use a higher or lower value. To make your selection, right-click the value or use the Selection button of the Ribbon as we saw earlier. If a field uses Yes/No values or check boxes in a form or report, you can get all records that are true (or checked) or all those that are false (or unchecked/cleared). 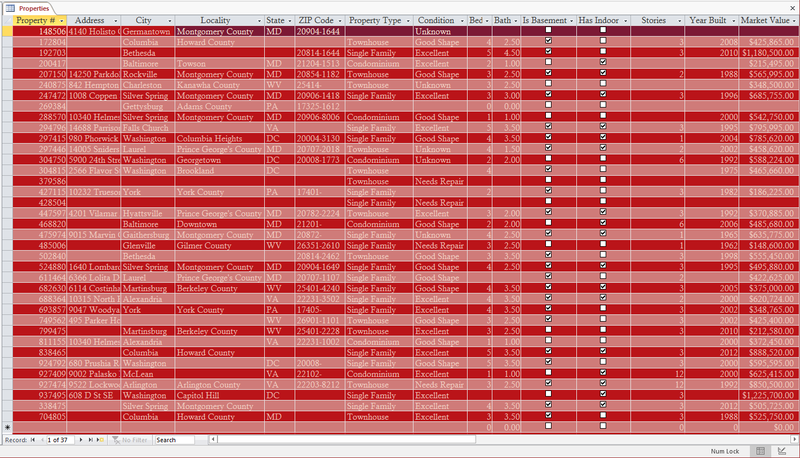 If a field is missing some values, you can find records that are empty or those that contain values. If you have a set of records with a string-based column, you may want to get a list of records that share a detail inside the string, also called a sub-string. 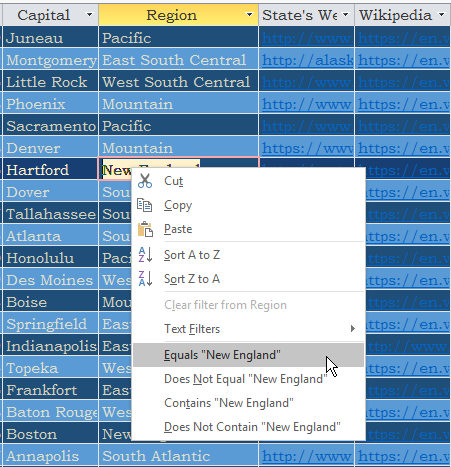 To exercise an advanced level of control on the sub-string or the combination of (sub) strings, right-click any field under the column, position the mouse on Text Filters and choose one of the options. The Custom Filter dialog box would come up. When using the Custom Filter dialog box, you can type an exact string or use some characters to create an approximate string. When using the Contains option, you must first select a string or a sub-string. In some cases, you may want the string to contain one or more characters or sub-strings. To select records that start with a certain letter or a sub-string of your choice, select the character or sub-string in the desired column. Right-click the selected leter or sub-string, position the mouse on Text Filters and click Begins With... In the dialog box, if you type just one character, such as c, you would get all entries that start with that character. 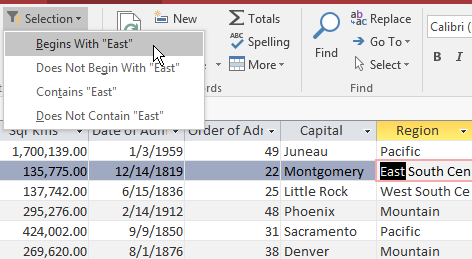 In the Sort & Filter section of the Ribbon, click Selection and click Begins With "East"
In the Sort & Filter section of the Ribbon, click the Toggle Filter button . 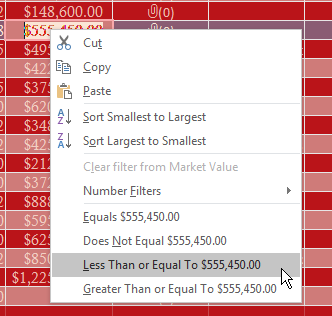 You can right-click a cell or text box, position the mouse on Text Filters, and click Does No Begin With.... In the dialog box, you can type one or a few characters that the values in the column should not start with. This would produce the opposite results of the Begins With option. This would produce all strings that include d, all strings that include g, and all strings that include u. Examples would be Arthur, Raymond, Bouba, Gabrielle, Maurice, or Orlando. In this case, the result would include all strings that don't have any of the characters in the square brackets.